In about a week, Gov. Mark Dayton will be sworn in for his second term as Minnesota governor. It was reported recently that Dayton will make education one of the primary focuses of this next legislative session. When one is a far left governor and said gov pledges to make something a top priority, it essentially means continuing to throw money at a system that is already floundering. As such, Minnesota Action Network, an organization which former US Senator Norm Coleman is affiliated, released an ad recently which was critical of how school teachers are retained. As usual, Gov. Dayton gave a very thoughtful, substantive retort. “Even before the session’s starting, running ads about denying some child a good teacher based on their ideological premise, to me is insulting, beneath what should be his dignity,” Dayton said. Yep. Four more years (or less?) of an erratic, thin-skinned member of the executive branch who has the audacity to chide others' financial status all the while ignoring the fact he used his inherited wealth (and his ex-wife's) to buy political office to push a progressive agenda. Nice gig if ya can get it. Oh, and in case you think the word "erratic" might be a bit harsh, consider this pivot from priority issues like transportation and education. "They talk about the concern about attendance at the Gopher games -- they start them at 11 o'clock in the morning," Dayton said Tuesday in an interview with the Pioneer Press. "I'm going to propose that we pass a law that no (Division I FBS) football game in Minnesota can start before noon." Dayton said 11 a.m. kickoffs -- as the Gophers had for home games this year against Northwestern, Purdue, Iowa and Ohio State -- are just too early. "If you want to tailgate, you have to be there by 9 a.m.," Dayton said. "Most students I don't think are awake at 9 a.m."
You mean to tell me we're going to get government involved in an endeavor like college football so college students aren't deprived of a bratwurst and a cold beverage four Saturdays per year? Goodness gracious, isn't bad enough that these young adults are already dependent on government for so much before they're even in the job market (e.g. government subsidized student loans, ability to remain on parents' health insurance until age 26, etc)? Once again, this is a cautionary tale of bigger government. Since the state of Minnesota is on the hook for nearly half the cost of the Gophers' home venue of TCF Bank Stadium, government feels they can dictate terms of the operation. We've already seen a glimpse of that with the Vikings' new stadium. The sad part is this behavior displayed by Gov. Dayton isn't exactly a deviation from his first term. Despite that, somehow he received more than 50% of the votes cast for governor eight weeks ago. Utterly stupefying. It's a distinct possibility Ndamukong Suh has played his last game in a Detroit Lions uniform as he has been suspended for this Sunday's wildcard playoff game against the Dallas Cowboys. Suh's punishment comes a day after he stepped on the leg of Green Bay Packers quarterback Aaron Rodgers. Suh "unnecessarily stepped on [the] opponent's unprotected leg as he lay on the ground unable to protect himself," according to a statement released by the NFL. Suh is appealing the suspension, and his appeal will be heard by Ted Cottrell. Lions center Dominic Raiola, who himself returned from a one-game suspension Monday, defended Suh's actions (ed. - Of course he did). "He was getting pushed back, you know," Raiola said. "... There's no way at that point in the game that he did something like that on purpose." Perhaps that's the case, but someone with a history of (to be charitable) questionable on-field tactics is not going to receive the benefit of the doubt. Suh has either been fined and/or suspended nine times in his five-year career. Besides, if you watch the video, Suh just walked away from Rodgers after stepping on him as if nothing happened. Are we to believe that Suh wasn't even aware he was standing on a human body part? This suspension is especially costly given that the Lions are the top ranked run defense in the NFL, thanks in large part to the interior line play of Suh. Detroit was going to need every bit of that stellar run defense against the NFL's second ranked rushing offense. Quite obviously, the Lions' task became that much more daunting. With Suh being a free agent after the season, there's been rumblings all year that he was looking to move on from Detroit. Now with this latest incident of leaving his teammates in a tough spot, will the Lions' organization even make an attempt to re-sign him? And how much money has Suh cost himself on the open market with these continued disciplinary issues? The Lions have won exactly one postseason game in the past 56 years. Breaking the bank for a player like Suh at the expense of maintaining a solid nucleus may not be the best course of action to exorcise those proverbial playoff demons. UPDATE: Suh wins appeal, will play Sunday. I'll be taking a rare and well deserved break from my radio program on this day. Nevertheless, you still have an opportunity to hear live programming from 1:00 until 3:00 pm as Andrew Richter and Jason Bradley of Community Solutions MN will be taking the reins (get a sneak preview of their broadcast here). So please give 'em at (651) 289-4488 if you'd like to discuss any of the topics they plan on addressing. You can also text comments/questions to (651) 243-0390. Steve Deace is a conservative political/social commentator. Guy Benson is Political Editor at Townhall.com and a conservative radio talk show host. The awful story of two New York City cops being fatally shot Saturday afternoon continues to resonate. In the immediate aftermath of the shootings, it was still fresh on the minds of many citizens the breathless media coverage of two high profile incidents (one in New York City and one in Ferguson, MO) where police officer actions led to the deaths of two black men. Neither officer was indicted. As such, many conservatives were quick to convey that "narrative journalism" as well as pointed comments by NYC mayor Bill de Blasio, US Atty General Holder and President Barack Obama stoked anger and divisiveness, which may have set off gunman Ismaaiyl Brinsley. While I feel the chanting points displayed by leftist politicians and their water carriers in the media were indeed unhelpful and divisive, I don't believe for one second any of them deserve blame for this tragic event. Regardless if Brinsley was incited by the demagoguery of Mayor de Blasio or the "white officer kills unarmed black man" media narrative, the responsibility ultimately lies with the individual who perpetrated the crime: Ismaaiyl Brinsley. With all that said, I'm not going to shed one single tear for lefties and their media cohorts as they come under a barrage of scathing rebukes. After all, nearly four years ago they were so quick to blame "tea party rhetoric" for the near fatal shooting of Arizona congresswoman Gabrielle Giffords in Tucson, AZ. As time went on, that theory was proven to be complete bull pucky once gunman Jared Loughner was found to have little to no interest or involvement in political matters. But now when the proverbial shoe is on the other foot, the media et al is cautioning us to not jump to any irrational conclusions and to let the full investigation play out. I can't decide if the media's sudden pivot to a reasoned tone is either comical or downright pathetic. Since I am out on assignment next Sunday the 28th, today edition's of The Closer will be my final broadcast of 2014. As usual, I will be on the air from 1:00 until 3:00 PM Central Time. There has been a ton of newsworthy items over the past week, including the Sony hacking scandal, President Obama seeking normalization with Cuba, Jeb Bush announcing a run for President and two Brooklyn cops being assassinated. Given that it's a guest intensive show today, I will get to as many of those items as I can. At 1:15, Major Jeff Strickler of the Salvation Army Northern Division will check in via phone. Maj. Strickler will discuss the fine work done by the S.A. this Christmas season, including some of their lofty financial goals to help the needy. Then at 1:30, Paul Ridgeway, who hosts a daily talk show on AM 1280's sister station AM 980 KKMS, will call in to the program. Paul himself has a wonderful story of how the Salvation Army positively impacted his life, so he'll be on to share that with us. Finally at 2:00, author/blogger/Townhall columist/friend of the NARN Katie Kieffer will stop by the Patriot bunker. 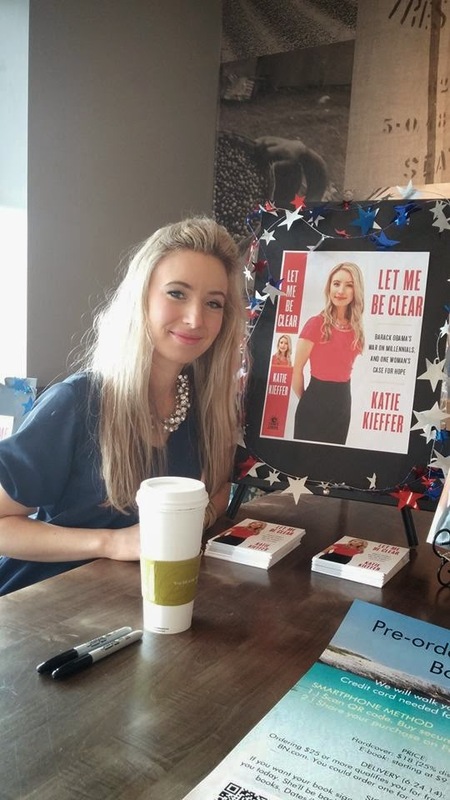 Katie will update us on how her first book, Let Me Be Clear....., is faring. She also be on to promote some upcoming book signings she'll have over the next couple of days. So if you have yet to purchase a Christmas gift for your favorite millennial, Katie's book is an ideal present. In the 14 weeks 1500 ESPN has hosted Thursday Night Football Trivia this year, I've attended 12 contests, including this week's endeavor at Floyd's Bar in Victoria. Hard to believe the season is over. But, win or lose, it was an absolute blast to participate week in and week out. Trivia MCs Judd and Phil were top notch. Anyhow, on to this week's details. I opened the season with a win, so I thought it might be kinda cool if I could bookend the year with a victory. In the opening round written quiz I got one answer wrong, so it was only good for a #3 seed in the bracketed tournament. In the quarterfinals, I took on a duo called The Sponge Bobs. I was sitting near them during the written quiz and one of the guys started trash talking me a little bit. I'm normally not hyper-competitive against those I don't know well but I wanted to crush these guys after that lame smack talk. As usual, this is a "Family Feud" style round where one has to buzz in for an opportunity to answer first. This was a best 2 of 3. Question one: What candy bar does rookie QB Johnny Manziel currently endorse? Brad (buzzing in first): Snickers. Correct. SBs (quick with the trigger finger): Sandy Stephens. ........they won a bowl game. Sandy Stephens is incorrect. Brad (I know they beat Alabama in the Music City Bowl in 2004; so that predates Adam Weber): Asad Abdul-Khaliq? Incorrect. Brad moves on to the semis with a 2-0 win. In the semifinal round, I took on a quartet of guys who went by the moniker Band of Idiots. The final four is a best 2 of 3, but some of the questions are in category format, meaning there are multiple answers. This year has an interesting twist. The rule now is if each player gets one correct answer, it moves to sudden death. That means the first person to give a wrong answer loses the point. Question one: Seven QBs in NFL history have thrown for at least 40 touchdowns in one season. Name them. Brad (buzzing in first): Peyton Manning. Correct. Question two: We're going to name a corporate sponsor and you tell us if they currently sponsor a major college football bowl game. So it's on to the championship round where I took on a trio called Get Dressed Stay Dressed (Yeah, I so don't wanna know). GDSD swept out Brendan Byrne in the semis. This is the same Brendan who won six titles this season and a whopping 22 over three years. With that in mind, I knew I was in for a battle to claim my third title this season. The finals are (mostly) the same categorical, sudden-death format for each question, though it's now a best 3 out of 5. Question one: Who are the Top 9 NFL quarterbacks in career passer rating? Brad (buzzing in first): Aaron Rodgers. Correct. Question two: We have a set of five statements here and you tell us whether they're "fact or crap." Statement#1; Former NFL RB Jim Brown won an Academy Award during his brief Hollywood career. Brad (buzzing in first): Crap. Correct. Statement #2: Packers QB Aaron Rodgers has not thrown a regular season interception at Lambeau Field in 4 years. Statement #3: As Patriots head coach, Bill Belichick has never had a below .500 regular season. Statement #4: Teddy Bridgewater's passer rating through 11 career games is higher than Hall of Fame QB John Elway's career rating. Statement #5: Randall Cunningham has more career postseason passing yards than Fran Tarkenton. Question three: The goal posts in the NFL used to be right on the goal line. What year did the league move them to the back of the end zone? The correct answer is 1974. Question four: Once again, we'll name a corporate sponsor and you have to tell us if they sponsor a major college football bowl game. GDSD (buzzing in first): False. Correct. And we are all knotted up at 2-2. It's only fitting that the season finale of 1500 ESPN Football Trivia would come down to a fifth and final question. For that, the MCs decided once again to go with the "closest to the pin" contest. Each contestant has 30 seconds to jot down an answer on a piece of paper. Question five: How many touchdown passes did QB Teddy Bridgewater throw in his career at the University of Louisville? Like the "closest to the pin" question asked earlier this round, we were informed the correct answer is somewhere in between each of our submissions. As MCs Judd and Phil built up the suspense, I figured it out in my head that if the correct answer is 69 or less, I win. If it's 70 or more, my opponent prevails. Alas, finishing second on this night wasn't all bad. I scored a pair of sweet seats to the Minnesota Wild game on Saturday, January 17! To summarize the year, I attended 12 trivia contests where I reached the championship round five times, emerging with two victories. I'm OK with that. Hopefully we can do it again next season. With that, thank you for indulging me in this little weekly excursion. To be perfectly honest, I'm torn over this one. The United States and Cuba ended more than a half-century of enmity Wednesday, announcing that they would reestablish diplomatic relations and begin dismantling the last pillar of the Cold War. The historic move, following 18 months of secret negotiations and finally made possible by Cuba’s release of detained U.S. aid contractor Alan Gross, fulfilled one of President Obama’s key second-term goals. The decision is likely to reverberate across many political frontiers where the standoff between Washington and Havana has played a role — including across much of Latin America, where U.S. policy on Cuba has long been a source of friction. Some critics of President Obama's action view this as merely another appeasement to a tyrannical nation. However, I view appeasement as kowtowing to another nation that could otherwise inflict harm upon the U.S. if tensions were not eased. But this is Cuba we're talking about, not China or North Korea. Even if "normalization" turns out to be a spectacular failure, I don't see it inflicting long term damage to America. On the flip side, it seemed that the release of Mr. Gross (a wonderful thing, of course) came at a steep price. And even if the embargo is lifted (can't happen without Congressional approval), how do the Cuban people benefit? It's likely that as long as the Castro brothers are in power, the citizens of that country will continue to be deprived of a better way of life regardless of what goods flow to their nation. A Washington Post editorial analogized this situation to that of what happened in another communist ruled country. Mr. Obama says normalizing relations will allow the United States to be more effective in promoting political change in Cuba. That is contrary to U.S. experience with Communist regimes such as Vietnam, where normalization has led to no improvements on human rights in two decades. Moreover, nothing in Mr. Obama’s record of lukewarm and inconstant support for democratic change across the globe can give (Cuba's leading dissident blogger Yoani) Sánchez and her fellow freedom fighters confidence in this promise. The one ray of hope I have is that if travel restrictions are loosened, it may allow Cubans to have an opportunity to experience life outside their oppressed existence. And if enough Cubans get even a small taste of liberty by visiting America and then being free to return to their homeland, it could possibly embolden them to install a similar way of life. Is that to say an uprising may be overly optimistic? Most definitely. But as long as the status quo remained in place, it was an iron clad guarantee that Cubans would never be free to realize that the world has indeed change in 50 years, though you wouldn't know it by their antiquated way of life. Let's face it: The 2016 campaign cycle essentially began the day after the 2014 midterms. As such, this announcement from John Ellis "Jeb" Bush was not at all unexpected. Given the reaction on social media, it seems pretty obvious that many have grown weary of the names Bush and Clinton (yes, it also seems to be a forgone conclusion that Hillary Clinton will run once again). Personally I think that's unfair to Jeb, as he is nothing like his father or his brother. Actually he's worse, something which David Limbaugh beautifully summed up via Twitter. Alas, there really isn't any reason for conservative and libertarian Republicans to have the vapors over this. I'm pretty sure that Bush will not be the only GOP candidate to declare for the 2016 race. So yes, as a matter of fact, I am keeping my options wide open. 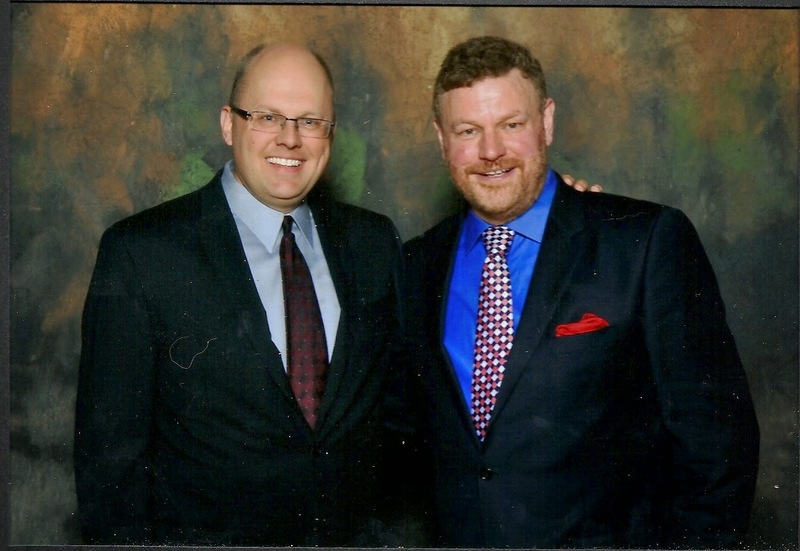 This is a photo of myself and the indomitable Mark Steyn. This took place about two months ago at the Center of the American Experiment's fall briefing. It was an honor listening to Steyn, as he is perhaps one of the more prolific right-of-center commentators and authors going today (He's become a regular fill-in host on Rush Limbaugh's radio show). Steyn is one of those rare personalities that can paint a clear portrait of how American is headed towards a Greece-like decline yet has us laughing uproariously about it the whole way down. The CAE is an terrific organization committed to espousing the virtues of free market principles. In fact, the Center is celebrating it's 25th birthday next year with an epic event in early June 2015. The keynote speaker that evening? None other than the preeminent political satirist (and whom my friend and NARN colleague Mitch Berg cites as a big reason he turned to conservatism) P.J. 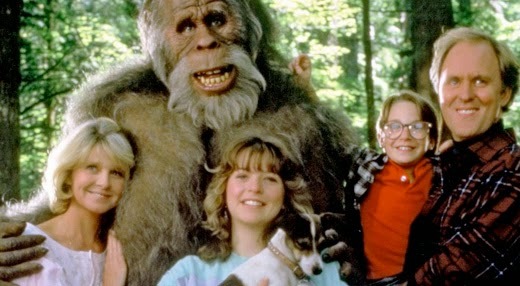 O'Rourke! I ain't missing this one!! Given the Twin Cities weather of late, I can't tell whether it's mid December or mid March. Regardless, it's a Sunday so that means another edition of my radio program The Closer. I will be on the air from 1:00 until 3:00 pm Central Time. In the first hour, I will look back at some of the top news stories from this past week, both locally and nationally, whether it's sports, politics or legal stuff (How's that for narrowing it down?). 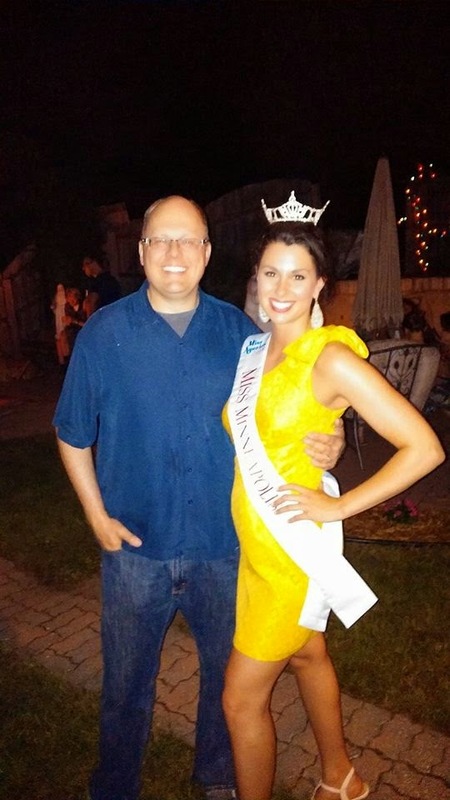 Then for the entire 2:00 hour, I welcome back to the program Miss Minneapolis 2014 Julia Schliesing. For those who have been regular listeners of my program for at least the past year, you know that Julia was a regular contributor for a few months earlier in 2014. Anyhow, she has about three weeks remaining in her reign as Miss Minneapolis, so she'll stop by the Patriot bunker as part of her farewell tour. We'll get her perspective on what the past 11 months has been like as a title holder as well as have her share a very special announcement about her future! Perhaps the best running back in the NFL over the past several seasons has been thrown for a loss again. All-Pro running back Adrian Peterson's appeal of a league suspension for a violation of the NFL's personal conduct policy has been denied, the league announced Friday. Peterson's appeal was heard by former NFL executive Harold Henderson last week in Washington, D.C. Henderson was appointed by commissioner Roger Goodell as arbitrator to hear the sides' cases and issue a ruling. An aside here. Upon hearing the name "Harold Henderson," does anyone else think of this? Anyhow, back to the business at hand. In upholding the NFL's initial ruling, Henderson concluded that Peterson "has not demonstrated that the process and procedures surrounding his discipline were not fair and consistent." Wrote Henderson: "He was afforded all the protections and rights to which he is entitled, and I find no basis to vacate or reduce the discipline." This should come as no surprise, given that the Commissioner's office had been given tremendous power to mete out discipline upon players violating the NFL's Personal Conduct Policy. Again, the players can in part thank their own union for not putting enough emphasis on that issue during the most recent collective bargaining session a few years ago. One issue that the Peterson camp continued to broach was their claim that NFL executive VP for football operations Troy Vincent allegedly told AP that once his case is adjudicated in court, his time on the Commissioner Exempt list would count as "time served." Vincent had denied making that promise. However, even if he had said such a thing, it would have likely been decided that he lacked the authority to make such a decision. Besides, missing several games with pay can hardly constitute "discipline." Peterson even gets to keep the money that accumulated while he was on the exempt list. As a Vikings fan, I'm just glad this is over. While I thoroughly enjoyed watching Peterson play for my favorite NFL team for seven seasons, I have to admit that I find it difficult to enjoy watching a pro athlete who I know has engaged in heinous off-field activities. As such, I'm not all that broken up over the fact that Peterson has likely played his final game in a Vikings uniform. 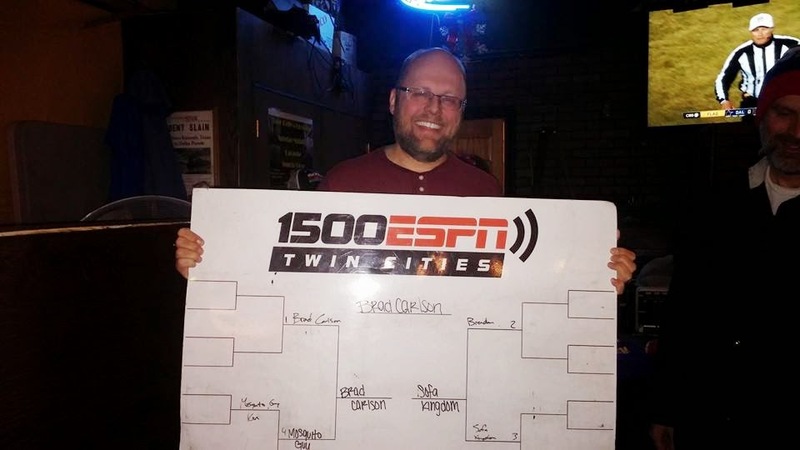 This week marked the next to last football trivia contest hosted by 1500 ESPN. The venue this time around was Poor Richard's Common House in Bloomington. It was a packed house when I arrived, given that Happy Hour went until 6:00 pm. As such, a number of folks stayed around for trivia, making it the largest pool of players/teams this season. After once again excelling in the written quiz, I earned a #3 seed and a first round bye for the bracketed tournament. In the quarterfinal round, I took on a trio who called themselves "The Dennis System." Question one: Dennis Green became the Vikings head coach in 1992 and led the team to the playoffs his first season. Who did the Vikings play in their only postseason game that year? Brad (buzzing in first): Washington Redskins. Correct. Brad (quick with the trigger finger): Daunte Culpepper. .......with that pick? Daunte Culpepper is correct. Brad moves on to the semis with a 2-0 win. In the semifinal round, I took on a familiar foe in Brendan Byrne. In the almost three complete seasons of football trivia, Brendan has amassed a whopping 21 championships. I have faced him on several occasions and I finally beat him the opening week of this season to win my first title. I always know I'm in for a battle when facing Brendan, but it was even more apparent this week. Last week Brendan had one of his worst ever performances having been dispatched quickly in the opening round. As such, he responded with a dominating performance in this week's quarterfinals. not even allowing the MCs to finish their questions before buzzing in. Anyhow, on to the semifinals. Question one: Six NFL teams have at appeared in at least 45 postseason games. Name them. Brad (buzzing in first): New England Patriots. Incorrect (they've been in 43). Brendan (for the win): Pittsburgh Steelers. Correct. For the second question, MCs Phil and Judd break out the "closest to the pin" contest. The answer is a number, so the contestant who gives a numerical answer closest to the correct number wins the point. Each player has 30 seconds to jot down their answer on a piece of paper. Question two: What is Brett Favre's career quarterback rating? Brendan gets the point and moves on to the championship round. And in a compelling, hard fought contest against another trivia stalwart in The Jermichael$, Brendan rallied from down 2-1 to earn his 22nd career championship with a 3-2 win. The 2014 football trivia finale will take place at Floyd's Bar in Victoria next week. In looking at a map, it appears I just take Highway 5 westbound until I run into it. If I hit South Dakota, I've gone too far....but not by much. On December 23, 2012, a mere nine days after several Sandy Hook Elementary School students were senselessly gunned down, then Meet The Press moderator David Gregory took to the airwaves to demagogue the tragedy. Gregory was asking National Rifle Association CEO Wayne LaPierre whether the NRA was willing to cede any ground on new gun legislation following the Dec. 14 elementary school shooting in Newtown, Conn. This display by Gregory caught the attention of those who are familiar with Washnigton, D.C.'s insufferable gun control statutes. As blog The Patriot Perspective pointed out, Gregory’s demonstration may itself have been a violation of existing D.C. gun law, where “Meet the Press” tapes. “No person in the District shall possess, sell, or transfer any large capacity ammunition feeding device regardless of whether the device is attached to a firearm. A ‘large capacity ammunition feeding device’ means a magazine, belt, drum, feed strip, or similar device that has a capacity of, or that can be readily restored or converted to accept, more than 10 rounds of ammunition,” D.C. code states. Violations may include a $1,000 fine or imprisonment for up to a year. Almost three weeks after the incident, the D.C. Attorney General declined to prosecute Gregory. In a letter to NBC, Attorney General Irvin B. Nathan admonished Gregory for knowingly flouting the law, but Nathan said he decided to exercise “prosecutorial discretion” and not pursue a criminal case. “Prosecution would not promote public safety in the District of Columbia, nor serve the best interests of the people,” Nathan wrote. Yes, I believe it would have been ludicrous to have prosecuted Gregory to fullest extent of the law. But the question many folks seemed to have is if it wasn't some Beltway elitist waving around an empty ammo magazine, would he/she have been given the same courtesy as Gregory? Highly unlikely. Not satisfied with AG Nathan's explanation, the folks at the website Legal Insurrection opted to file a Freedom of Information Act claim in May 2013, citing an effort to "obtain documents regarding David Gregory’s violation of the District of Columbia gun laws and the investigation which led to the decision of the District of Columbia Attorney General not to prosecute." Nearly a year and a half after filing the FOIA claim, Judicial Watch, the organization representing LI in this case, announced this week that LI had won its suit (Read the press release here). Part of the documentation released was the January 7, 2013 affidavit filing seeking Gregory's arrest. It was four days later when Nathan announced he would not be moving forward with the case. Why? Speculation abounds. But what has been ascertained is that MTP officials inquired about using high capacity magazines on the 12/23/2012 show and were specifically told such items were illegal, even if empty. Nevertheless, Gregory trotted it out that Sunday. It was almost as if he knew he would not be prosecuted. Huh. Western Samoa achieves independence from New Zealand; its name is changed to the Independent State of Western Samoa. My old man was a mere five months away from graduating high school (Yikes!!!). That day also marked the last time the University of Minnesota football team played in a bowl game on New Year's Day. But in a little more than three weeks, that all changes! My favorite college football team playing on the coveted New Year's Day time slot. I literally have no idea what this will be like....but I'm eager to find out!! Another Sunday means another edition of The Closer. I'll be on the air in my usual time slot of 1:00 until 3:00 PM Central Time. If there was ever a week that validated the mainstream media's descent into full-fledged narrative journalism, this past week was it. I'll get into some of the major stories which served to accentuate such standards (or lack thereof). At 1:30, fellow Twins rube and 1280 The Patriot promotions guy Ross Brendel will be checking in. We'll discuss the Twins' offseason thus far, including the signing of free agent Torii Hunter, who was perhaps the second most popular Twin over the past 30 years. The at 2:15, St. Cloud State University Economics professor and Northern Alliance Radio Network colleague King Banaian will join the program. We'll discuss the Minnesota economic forecast released last week as well as the U.S. recently surpassing the $18 trillion mark on its debt. King also has some valued insights on the latest jobs report as well as surprisingly low gas prices of late. I was attempting to channel the postseason version of the 1987 Minnesota Twins as this week's Thursday night football trivia took place at Beer Belly's in our neighboring suburb of Anoka. As such, I considered this my home turf. After acing the first round written quiz, I earned a #1 seed and first round bye for the bracketed tournament. Since there were only six teams, I had an automatic berth in the final four. A gentleman who called himself "Mosquito Guy" earned the right to oppose me in the semifinal round. Question one: Eight different NFL quarterbacks have thrown at least 20 interceptions in their postseason careers. Name them. Mosquito Guy (buzzing in first): Peyton Manning. Correct. Mosquito Guy: Tom Brady. Correct. Mosquito Guy: Fran Tarkenton. Incorrect. The next question is a new game called "Closest to the pin." The answer is in numerical form, so whomever arrives closest to the correct answer wins the point. Each contestant has 30 seconds to jot down a number on a piece of paper. Question two: According to Forbes, what is former football coach (turned broadcaster turned video game big wig) John Madden's net worth? Brad moves on to finals with a 2-0, win. In the championship round, I took on a guy who went by the moniker "Sofa Kingdom." Since SK easily dispatched 21-time champion Brendan Byrne in the semifinals, I knew he was very formidable. Question one: Name the 12 NFL teams who would be in the playoffs if the regular season ended today. SK: New England Patriots. Correct. Brad (Thinking, thinking, thinking. Using the entire allotted 30 seconds): Cleveland Browns? Incorrect. Time once again for the "Closest to the pin" contest. Each contestant has 30 seconds to write down a numerical answer on a piece of paper. Question two: In the 2014 NFL season, there have been how many successful two-point conversions? The correct answer is a mere 22. Brad ties it up, 1-1. Question three: In Division I college football, there are seven teams with either 0 losses or 1 loss. Name them. Brad (buzzing in first): Florida St. Correct. Brad (Taking literally every possible millisecond before one came to me): OHIO STATE!!! Correct. SK (Thinking, thinking, thinking. ): Ole Miss. Incorrect. Question three: This season, there have been 12 different Vikings players with at least one rushing attempt. Name them. Brad (buzzing in first): Jerick McKinnon. Correct. SK (thinking, thinking): Charles Johnson. Incorrect. For the second time in 2014, I capture the 1500 ESPN Thursday Night Football Trivia championship!!!!!! Yes, in an impeccable impersonation of the 1987 Minnesota Twins, I was downright dominant on my home field! A couple of hours before the contest started, I put out on Facebook an offer for my Anoka County friends to come root me on to victory. If I won, the prize would be $100 in gift cards, part of which I'd use to buy my adoring fans one round of drinks. Only the fetching Mrs. Carlson took me up on the offer, with which she ordered a nice Chardonnay (I was surprised it didn't come in can given what a "hole in the wall" the place was). Having broken through and actually won a contest, the only question remaining is can I go back-to-back? Come to Poor Richard's Common House in Bloomington next week to find out! If my Minnesota Twins had signed any 39-year old free agent outfielder who put up decent offensive numbers in 2014 but whose defensive prowess was awful, I would be utterly stupefied by such a move. Ah, but this isn't just any 39-year old outfielder. Torii Hunter, the 16-year veteran free-agent outfielder, is returning to his roots with the Minnesota Twins. Hunter, after playing five seasons for the Los Angeles Angels and two with the Detroit Tigers, signed a one-year, $10.5 million deal with the Twins, the team announced Wednesday. The Texas Rangers and Baltimore Orioles were also reportedly in the running for Hunter. Hunter, 39, played his first full season for the Twins in 1999. He has made five All-Star appearances and won nine Gold Glove Awards and two Silver Slugger Awards. He is a career .279 hitter with 331 homers and 1,310 RBIs. Quite obviously this signing is more for intangibles than anything else. First off, it'a good public relations move. This year's Twins season ticket renewals were quite feeble and the club doesn't have the MLB All Star Game in 2015 to serve as an enticement. As such, it makes sense to bring back perhaps the most popular Twins player since Kirby Puckett. In addition to P.R., the Twins organization hopes Hunter's impact lasts beyond this one season. Outfielder Aaron Hicks, whom the club was high on but thus far has been a disappointment, grew up idolizing Hunter. Perhaps Hunter's presence and keen insights will be just what Hicks needs to rev up what has been a sluggish start to his MLB career. It would also be nice to have Hunter's demeanor in what has been a dormant Twins clubhouse the past four seasons, especially when stud prospects Byron Buxton and Miguel Sano arrive sometime in 2015. While Hunter was still a productive offensive player in 2014 (.286 BA with 17 HRs and 83 RBIs), his outfield defense was horrid. Since the Twins scored the 7th most runs in all of Major League Baseball last season but ranked in the bottom four in each of 4 major pitching categories (ERA, Quality Starts, WHIP and Batting Average allowed), adding a merely decent bat at $10.5 million makes little to no sense from an on-field standpoint. However, that's just further evidence that the Twins (especially new manager Paul Molitor) are banking on Hunter providing a valuable mentoring role, which was similar to what Molitor provided Hunter when the two were in the Twins organization from 1996 through 1998. Given this is only a 1-year deal, it wouldn't exactly be an utter disaster if Hunter is a complete bust. However, it will be interesting to see how he would react if the Twins are in the midst of yet another lost season by July. In the past 14 seasons of his career, Hunter has been on only two teams with losing records (the 2007 Twins were 79-83; 2010 Angels were 80-82). But neither of those teams were as utterly inept as the Twins of 2011 through 2014, who have averaged nearly 96 losses per year. It goes without saying that I would rather not witness how Hunter would endure a dreadful 2015. The mainstream media couldn't be bothered with recently unearthed video footage of MIT professor Jonathan Gruber admitting to hoodwinking Americans while crafting Obamacare five years ago. But a Congressional Staffer criticizing the "first children" on her personal Facebook page? OUTRAGEOUS!!! A Congressional communications director resigned today after making disparaging comments about Sasha and Malia Obama on Facebook, ABC News has learned. Elizabeth Lauten, the communications director for Rep. Stephen Fincher, R-Tenn., last week criticized the girls' demeanor during the annual White House turkey pardoning ceremony, writing on Facebook: "Dear Sasha and Malia, I get you’re both in those awful teen years, but you’re a part of the First Family, try showing a little class. "At least respect the part you play. Then again your mother and father don’t respect their positions very much, or the nation for that matter, so I’m guessing you’re coming up a little short in the ‘good role model’ department. Nevertheless, stretch yourself. Rise to the occasion. Act like being in the White House matters to you. Dress like you deserve respect, not a spot at a bar. And certainly don’t make faces during televised public events." Lauten was widely criticized across social media for her comments. She then deleted her original post and wrote an apology on Facebook that she sent to ABC News. "After many hours of prayer, talking to my parents, and re-reading my words online I can see more clearly just how hurtful my words were," Lauten wrote. "I'd like to apologize to all of those who I have hurt and offended with my words, and I pledge to learn and grow (and I assure you I have)from this experience." In a phone call, Lauten choked through tears as she told ABC News that she had resigned Monday morning. She refused to discuss the circumstances surrounding her resignation, instead pointing to her Facebook apology as her comment on the incident. Before I say another word, I wanna get on record that I believe it is utterly inappropriate to criticize the minor children (the Obama daughters are both under age 18) of the President (any President for that matter). Regardless of what their parents do for a living, kids should be allowed to be kids. With all that said, I'm utterly amused by the faux outrage expressed by so many leftists. Let's face it: this provides a nice diversion from news events (like a white Bosnian immigrant being beaten to death in St. Louis by minorities) which don't quite fit the lefty template. - My Congresswoman, Michele Bachmann, is mere days away from wrapping up her fourth (and final) term in the U.S. House. As such, Rep, Bachmann recently took to Buzzfeed and compiled 16 Things I’ll Miss About Being In Congress: Macklemore, MSNBC, and Minnesota. A look back at 8 years in Congress. The list is equally self-deprecating, poignant and fun, further proof that the vitriolic verbal attacks levied towards Bachmann were the proverbial water off a duck's back. - The St. Louis Rams have been at the epicenter of two of the more high profile news stories in 2014. Last May they drafted LB Michael Sam, the first openly gay football player to be signed by an NFL team. Then this past Sunday, a handful of Rams players decided to convey a pregame demonstration in regards to the incident in nearby Ferguson, MO. Prior to Sunday’s game versus the Oakland Raiders, several members of the St. Louis Rams offense came out during pregame introductions with their hands up as they entered the field at the Edward Jones Dome. Wide receivers Stedman Bailey, Tavon Austin, Chris Givens and Kenny Britt and tight end Jared Cook all took the field displaying the gesture, which mimics the “Hands Up, Don’t Shoot” stance that has become a frequent image among protesters since the shooting death of 18-year-old Michael Brown by police officer Darren Wilson in nearby Ferguson, Mo. in August. What's ironic and downright sad is if Brown had done that very thing ("Hands Up, Don't Shoot"), he'd be alive today. The NFL has chosen not to fine the players and a Rams executive may or may not have issued an apology to an agitated St. Louis Police Department. Personally, I was not the least bit offended by what the Rams players did on Sunday. However, I did find it a little odd they chose to pay homage to a petty thief. Your mileage may vary.